A massive mud flow that has displaced some 15,000 people in Indonesia's Java island halted briefly for the first time in 10 months, officials say. The mud stopped flowing for around 30 minutes on Monday morning, members of the team trying to plug the flow said. 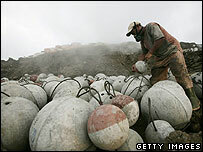 They have been dropping hundreds of concrete balls into the mouth of the hole to stem the eruption. Some scientists say the mud flow was likely triggered by gas drilling, but the gas company blames an earthquake. The flow has submerged whole villages, destroying thousands of homes and businesses, since it erupted at the end of last May near the city of Surabaya in East Java. The team's Rudi Novrianto said the mud stopped for half an hour shortly before noon (0500GMT) on Monday. "None of our team members knows for sure what happened and we are still trying to determine how it happened," he said. Some team members said the temporary halt to the mud flow was a sign that their efforts were working, but warned it could still be another few months before it stops for good. "There's a possibility that a new equilibrium between the concrete balls and the mud pressure is almost established and the mud has absorbed the energy of the balls," team member Bagus Endar told Reuters news agency. "It is a positive indication. I'm surprised by this finding." The team has been dropping 1.5m-long metal chains, each with four concrete balls attached, into the hole since last month. They aim to drop 1,500 balls, each weighing up to 250kgs (500lbs). While some experts have doubted that the plan - believed to have never been tried before - would work, supporters hope it will reduce the amount of mud flowing from the site by up to 70%.